BusinessWise Capital Advises Marshall Communications Corp on its Sale to Mission Solutions Group, Inc.
BusinessWise Capital, LLC is pleased to announce the acquisition of Marshall Communications Corp by Mission Solutions Group, Inc.
BusinessWise Capital, LLC (“BWC”) is pleased to announce the acquisition of Marshall Communications Corp (“Marshall”) by Mission Solutions Group, Inc. (“MSG”). This transaction expands MSG’s capabilities into the Satellite Communications and C4ISR space, while providing it access to valuable contract vehicles, past performance, and human capital. 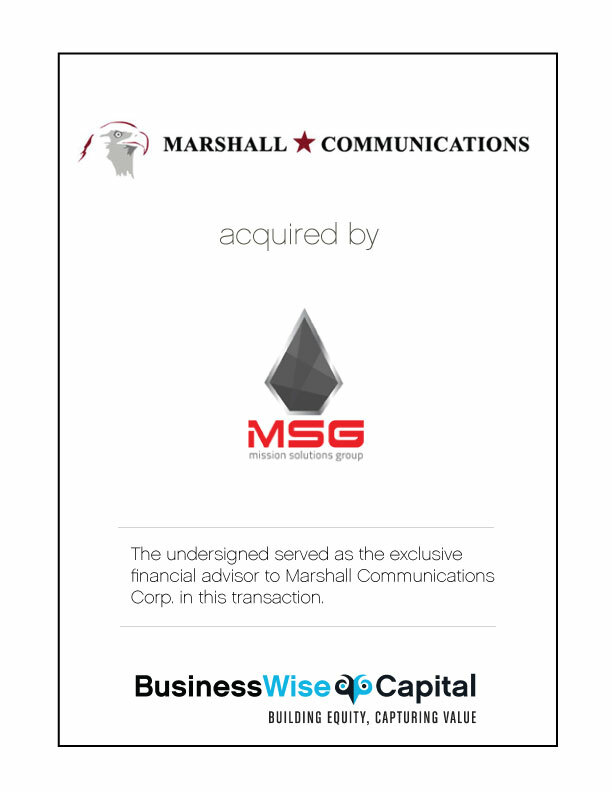 Marshall will operate as a wholly-owned subsidiary of MSG and will be led by MSG’s senior leadership. BWC is a boutique M&A advisory firm to middle-market government contractors. BWC provides a full range of M&A, valuation, corporate finance, and tax services to enable our clients to achieve their growth and liquidity objectives.